Last night the chaps finished cutting wheat for the year — just 6 days. We had hot windy days, only a sprinkle of rain, and fortunately no major breakdowns. So it was smooth sailing, that is, until they parked the truck in the shed a little too close to the wall. The front wheel sunk in the dirt and leaned the truck bed against the wall. Over the past two months I’ve been learning the underworld of the self-employed. My conclusion? Get an accountant. Or a personal assistant in India. Or maybe it should be an accountant in India. Whatever. A: Well, I have a couple. My driver’s license has my married name, so I guess you can just use that one, unless you need to use my social security number, which has my maiden name. A: Well, I don’t really have a job, and we’re going on a big trip for a few months. After that I plan to be self-employed. Q: What’s your husband’s phone number? A: Good question. I’ll have to call you with that one. Q: Where does he work? A: He doesn’t have a job either right now. Fast forward six months. Mr. Farmer has a job (hooray!). And indeed I’m self-employed — probably more employed than I intended. And today is April 11, which means a ton of tax things are due in 4 days. I’ve been trying for a week to decipher all the federal and state estimated payments stuff. Tonight I finally wrote the checks (because they have to mail you a PIN to pay online — doesn’t this defeat the purpose?). And we filed our 2009 income taxes tonight. Finally — this one’s been going on for weeks. Realization: income taxes are about double in Kansas as in Illinois. To top all that off, we bought a car last weekend, which added a whole new dimension of taxes due this month. That’s not to mention getting plates for Mr. Farmer’s truck — during which he learned that Kansas has personal property tax on vehicles (doesn’t exist in Illinois). So with all this tax goop going on, let’s hope that the most inconvenient truth about self-employment doesn’t throw a wrench in our finances: I never know when I’m getting paid. I hear the check’s in the mail…famous last words. Overall assessment tonight: dull. These people can’t pick songs worth a darn. Thank goodness for Crystal Bowersox. Late this afternoon, just as I had completed getting my Chase extras points for a $50 gift card to Macys and was cruising Macys.com to find the Michael Kors pants I’m eyeing in Lucky Magazine, I heard a “vroom vroom” outside. Had to be dad on the 4-wheeler spraying for henbit in the yard. He’d been by earlier to get a start on it, but I’d stayed in the house on my conference call, and now he was back to finish. It occurred to me that I do actually have a vehicle (pronounced vee-HIK-il in these parts). Yes, I have Mr. Farmer’s ATV sitting in the shed across the driveway. No longer will I be stranded in my house with only my legs to carry me. Then I realized that I had no idea how to run it. Good thing Dad pulled up just then to the end of the sidewalk, and after a tour of the yard (to figure out where to put the garden, now that he’d just sprayed to kill every green thing except grass) and a tour of the barn to put out rat poison, we ambled over to the shed to learn me some ATV startin’. Imagine this…it actually starts by turning a key! So I took it out for a spin in the yard, then sped with my hair wooshing behind me a half-mile up the road, half hoping that Mr. Farmer would be showing up just then to see that his wife has now comandeered his toy. Wee! Last Friday we got word that one of my great aunts had died, so on Tuesday I went along to her funeral. She’d lived a long and happy life, only learning a few weeks ago that leukemia was going to get the best of her. But, despite the somber occasion, it was nice to see my fringe relatives and old family friends. All three of my dad’s sisters accompanied us to the funeral, with one of them flying in from Arizona. So Mom took the opportunity to pull out the remaining things from my grandparents to divvy up. Most of it was junk, in my humble opinion. 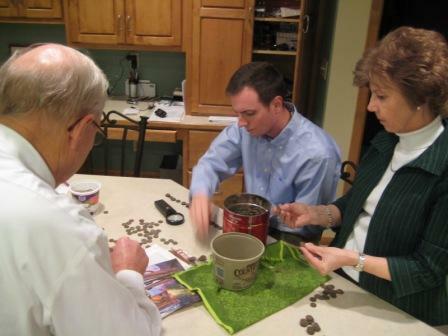 But there was about $300 in coins that Grandma had once buried inside the machine shed when they were going on vacation. Why? Who knows. But there they sat on the kitchen counter, equally divided by coin type and date in four cottage cheese containers. There were a ton of silver dollars from the 1970s. But the pennies. OMG. An entire big coffee can FULL of old pennies that hadn’t yet been touched. My aunts were in favor of sorting out the ones with wheat backs and then sending the rest through the coin counting machine. So after the aunts had left, my parents and Mr. Farmer and I got sucked into sorting them — at 9 p.m., when we should’ve been thinking about going to bed or watching bad reality TV or something. Mom and Dad separated the wheat from the chaff, and Farmer and I sorted them by decade. Well, I sorted them by decade and Farmer diligently sorted them by year. We’re still not done. Most of them are just worth, well, pennies. P.S. Is it just me, or is it funny that there’s an article in the local paper that says the “birthday group got together this month, even though there weren’t any birthdays”? Long story short, we officially took up residence in the house I grew up in on January 25. Since that time, 164,508 absolutely hilarious things have happened, most centering on Mr. Farmer’s observations of life in a new dimension. Like the fact that all of the high school basketball coaches (and some of the players) are related. Or that he’s now related to most everyone in a 20-mile radius. And that I do the Jane Fonda workout in the church basement on a regular basis. As my brother says, the meal plan isn’t bad either. We partake in Mom’s excellent cooking quite a few times a week. But we’re also hosting a lot more people these days. In Chicago, I’m certain that in my over six years of living by myself, I hosted people no more than once a year. If that. I think we’ve had people over that many times in the last month here on the farm. And we really like it. I’m looking forward to the day that Mom finds the Pioneer Woman Cookbooks she hid from herself before Christmas, so that my buddy Mrs. Firewife and I can start cooking our way through it. Last night Firewife made PW’s poundcake with strawberries and cream while I relied on Ming Tsai for Asian-inspired pork tenderloin (grilled by Mr. Farmer), mashed sweet potatoes, apple chutney and sesame-dressed salad. My brother and his wife joined us to make six. Holy cow, Galloping Nelly is nearly three years old. During that time I’ve gone on hiatus a few times – mostly to pursue laziness – but this time it’s with purpose! Mr. Farmer and I have created a new blog to chronicle our trip around the world. So from now until January 20, you can read our updates at www.gallopingtheglobe.wordpress.com. I’ve been gettin’ all wound up about the neat-o things I can write about while we’re on our voyage. Including stumping Mr. Farmer with the 8,666 trivia questions in the book in my carry on, sharing my reading list and generally reporting our observations of different countries, cultures and experiences. While we’re away, you can also reach us via Skype. So if you have an account and would like our info, just post a comment on Galloping the Globe as such and I’ll e-mail it to you. Other than that, fasten your recliner belts, and let’s hope the bed bugs don’t bite.